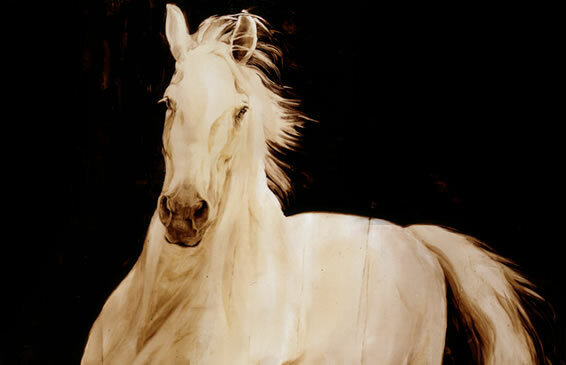 Kiki Martinez paints powerful, lifesize images of horses and majestic animals. Horses gallop straight towards you while others are quietly peering out with the softest of gazes. Using an old master's glazing technique Kiki creates a magnificent dramatic effect bringing her horses to life. Kiki's monochromatic paintings are never flat or opaque, but are filled with an atmosphere penetrated by reflected light. With a traditional technique and approach to painting, Kiki has created something very contemporary. Taking equine art to a whole new level, overcoming her viewers'expectations of what equestrian art is capable of expressing, her paintings of horses embrace the world of fine art.